Jon O'Bergh is an author and musician who loves a good scare. His first novel, The Shatter Point, presents a modern ghost story wrapped in a thriller. He has written two innovative e-books that combine music and stories: Song of Fire, a reflection on the role of music in our lives, and A Book of Hauntings, a collection of short stories. With Andre Akinyele he co-wrote Elliptical: The Music of Meshell Ndegeocello, the first comprehensive look at the work of this iconic musician. Jon has been playing piano since the age of seven. He graduated with a Bachelor of Arts from the University of California at Irvine, where he studied piano performance and composition while performing with a rock band. He has written and produced over one dozen albums, including Carta, which reached #1 nationwide on the NAV chart, and the atmospheric album Ghost Story. Jon's musical style defies genre, embracing rock, jazz, funk, world, ambient, techno, experimental, EDM, electronic, and neo-modern solo piano, with wide-ranging influences that include Meshell Ndegeocello, Herbie Hancock, Tori Amos, Steely Dan, Zuco 103, Vince Guaraldi, Miguel Migs, &Me,​ Kraftwerk, Laurie Anderson, and Nine Inch Nails. Jon has written songs, music for television, and concert music. Timescape 2 for piano and violin introduced his music to San Francisco audiences in a concert that was subsequently broadcast by National Public Radio station KQED. 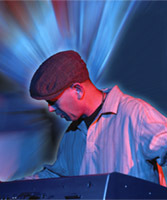 For five years he performed with the jazz/funk fusion band Gemini Soul, which was voted the #1 band in the San Francisco Bay Area. He has recorded 6 albums with Gemini Soul, including the 2015 release Willona's Boutique.